November 13, 2009, Everett, Washington, Boeing (NYSE: BA) has taken the Boeing 787 Dreamliner from development to the assembly line, Boeing has completed installing reinforcements within the side body section on its first 787 Dreamliner. The Boeing 787 Dreamliner is a midsized, wide body, twin-engine jet airliner. On January 28, 2005, the aircraft's development designation 7E7 was changed to 787. Early released concept images depicted a radical design with highly curved surfaces. On April 26, 2005, a year after the launch of the program, the final and more conventional external 787 design was set. Its maximum seating capacity in a one-class configuration is between 290 to 330 passengers depending on variant. Boeing states that it will be more fuel-efficient than earlier Boeing airliners and will be the first major airliner to use composite materials for most of its construction. Boeing featured its first 787 in a roll-out ceremony on July 8, 2007, at its Everett assembly factory, by which time it had become the fastest-selling wide-body airliner in history with nearly 600 orders. A total of 850 Boeing 787s has been ordered by 56 customers as of September 2009. Originally scheduled to enter service in May 2008, production has been delayed multiple times, and in August 2009, the scheduled service entry date was pushed back to the fourth quarter of 2010. The aircraft's maiden flight, originally planned for September 2007, is now expected by the end of 2009. The modification entails installing new fittings at 34 stringer locations within the joint where the wing is attached to the fuselage. Installations have been completed. Boeing expects to complete the installations on the static test airframe and the second flight-test airplane in the coming days. "Completing this work is a significant step toward first flight. We continue to be pleased with the progress of the team and remain confident the first flight of the 787 Dreamliner will occur before the end of the year," said Scott Fancher, vice president and general manager of the 787 program. "We will test the modification on the full-scale static test airframe later this month. As soon as we confirm the loads are being handled appropriately in the joint we will complete preflight activities on the airplane." Once the modification is complete on the static test airframe, it will be refitted with strain gauges and instrumentation required for testing. Access doors, systems, seals and fasteners removed from airplane No. 1 to provide access are being restored in preparation for continued testing on the airplane. 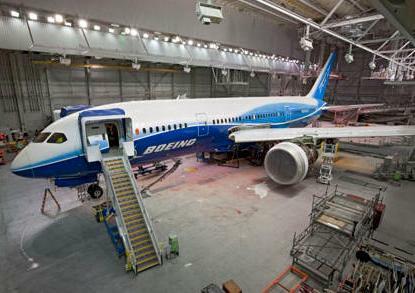 Boeing continues to install fittings on the fatigue test airframe and the remaining flight-test airplanes. Other airplanes will be modified in the weeks ahead. Overall, the work on modifying airplanes is progressing well, Fancher said. "We have a strong and capable team that has performed exceptionally well," Fancher said. "I'm very pleased with the team's dedication to meet our commitment to fly before the end of the year." After airplane No. 1 is restored, the flight-test team will perform another set of gauntlet and taxi tests to ensure that all systems are ready for flight. Fancher noted that with the exception of a single high-speed taxi test, all remaining first flight activities have been successfully completed on the first flight-test airplane.